Welcome to my new guest series Weaning Wisdom Wednesdays. 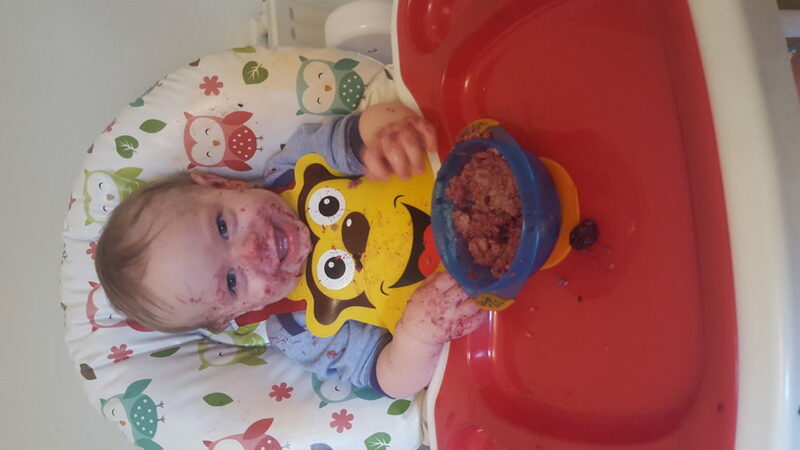 Each week, a guest blogger will feature, either by writing their own original piece about what they’ve learnt during their weaning journeys or by answering my set of questions. This week we are joined by the lovely Claire from Dear Mummy Bear. Hi Claire, welcome to Weaning Wisdom Wednesdays. Please start by introducing yourself and your family. I’m Claire, I’m a 25 year old first time parent as is my partner Alex, and we have a just turned 1 year old little monkey. After lots of research, we (I) chose to go ahead with baby-led weaning. It’s perfect for us and suited us all so well. Especially as even if I tried to give bear a spoon of yogurt or beans or something similar, he just took it off me & was forever trying to steal our food haha. 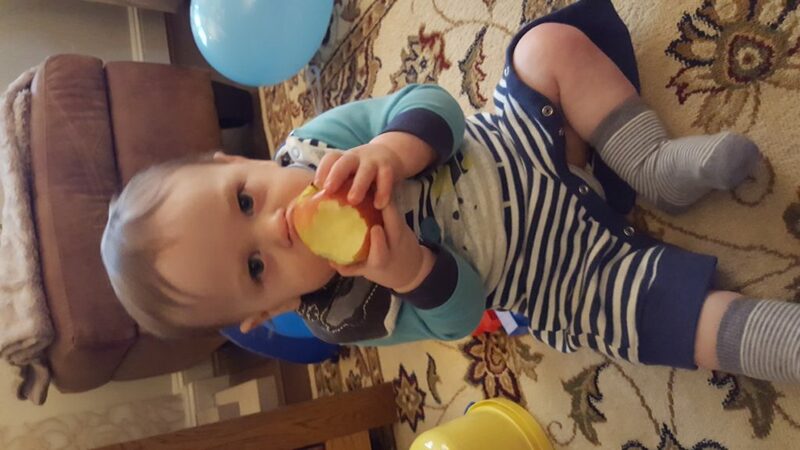 We started weaning the day he turned 6 months old. I think he was about 26 weeks and 2 days. I was simply following guidelines from my health visitor and the NHS & WHO websites and from being on baby led weaning pages on Facebook too. I also wanted to wait until he was fully interested in food too. Up until a couple of weeks before, he was mostly just booby milk all the way but then I’d started to notice. I was also looking out for the other signs, sitting unaided & having good use of being able to push food out with his tongue. So after all the fretting and stressing, I just gave him some lunch of tuna mixed with Greek yogurt on a wrap with cucumber & cheese and some tomato on the side. Though I will be honest, I had tried him with a few tasters in the couple of weeks leading up to 6 months, but only just a little nibble of some mango (I held it haha), a sweet potato chip & a green bean (all on different occasions) and he seemed to enjoy it. But yeah, once we started, I just gave him stuff like tuna wraps or salad veggies or bits of fruit for him to chew on. So he likes most stuff but his favourites are bananas and yogurts definitely. He also likes quiche as I found out yesterday and he loves chicken curry, meatballs & pasta and soft tacos with mince beef and salad. I don’t think there’s anything he doesn’t like though. Actually, he isn’t keen on humus. Not one bit haha. We use a My Babiie one we picked up from an Aldi Baby Event. I think you can get similar ones online too. its really easy to clean and I like that it has padded cushioning. It also has different heights so I can bring him lower down to my level if we’re doing activities or higher to the table for eating etc. It also has a removable bit on the tray so its easy to clean etc. I highly recommend. I guess everyone’s idea of fast food differs, if we’re eating at more of a restaurant than a fast food place that’s okay but like I said before, he’s never had Maccies, KFC, Subway, Taco Bell, Burger King or anything like that. I get so anxious over salt and the unhealthiness of it all, we as parents don’t feel its necessary but I can see why some people use it if they’re rushing or haven’t had chance to cook etc. However, that all being said, I have been known to use toddler ready meals on occasion, like the Little Dish ones or Ella’s Kitchen. Rarely though. I think just when I get a little stressed that he throws food on the floor or when he wouldn’t drink water was probably the most challenging. And the worry of him choking which he’s only really done twice which of course, we got him out and patted his back until the food came unlodged but didn’t bother him in the slightest. Confusion more than anything. Like family members will have said “oh do you want me to blend it” or “won’t he choke on that” (usually my grandad over the most basic of foods but I guess they’re not used to it. I’ve had a couple of people say they don’t think they could do it, they don’t understand how a baby can chew food and stuff but no criticisms really. More wonder than anything like when I’m doing the tesco shop and he’s munching his way through an apple haha! I meal plan on occasions. I have an idea in my head of the meals we’ll make and work out if there’s leftovers and what to do with them etc but mostly I just have to get meat out of the freezer or just make sure I have the bits in for what we fancy. We were gifted a Happy Mat for his birthday which has come in so so handy for eating out. The Tommee Tippee free flow cups are amazing too, they’re the ones he uses the most to drink of all the ones hes tried haha. And long sleeved bibs, cannot praise them enough. I usually use them when we’re having like pasta and sauce and other messy meals and they protect his clothes really well and means he can get super messy. We recently bought a Tidy Tot bib and mat set which we’re slowly introducing. I definitely should have bought this before though, absolute game changer! I’m not sure I’d do much differently if I’m honest. Maybe trying to get him to drink more water but I can’t do much more offering than I already did. I practically forced it on him haha! I’d introduce cutlery more too, hes only just getting the hang of it really but I only offered it at times when it may have been required. Don’t panic or stress or worry yourself too much. There is a lot of support and advice out there for whatever you do weaning wise, with health visitors, friends, mums online etc. I got so stressed out and it was actually a piece of wee wee haha! 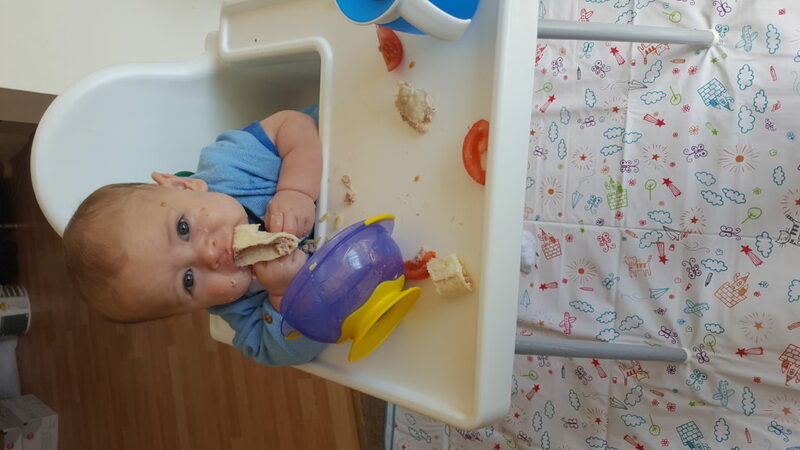 I love the look of wonder from other people when you’re doing baby led weaning… like, yup! My kid just ate that! !